Hammock strewn beaches, insanely blue water, and gorgeous protected bays, the Virgin Islands are beckoning to be explored. 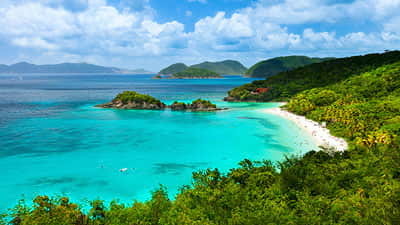 The British Virgin Islands are made up of four main islands and over 50 isles- only 15 of which are inhabited. The neighbouring United States Virgin Islands is an American territory and is comprised of a group of small islands, including the main island of Saint Croix, Saint John and Saint Thomas. With gorgeous reefs and crystal clear blue water, snorkeling and scuba diving are top notch. Find your adventurous side ziplining, or just lounge while you charter to balmy beaches and hidden coves.